Seeing as it’s Valentine’s Day, it is only appropriate that we have a story about love. This, however, isn’t probably going to be exactly the story that you’re expecting. Before I became a wife and a mother, I loved ballet. I started dancing when I was 3 and eventually spent years dancing for hours upon hours each day. I loved the movement, the music, performing, the physical challenge, the satisfaction of seeing progress… It gave me so much enjoyment and was a huge part of my life. Once my husband and I married, we had our eyes firmly set on our God’s call to the mission field and our hope to start a family. 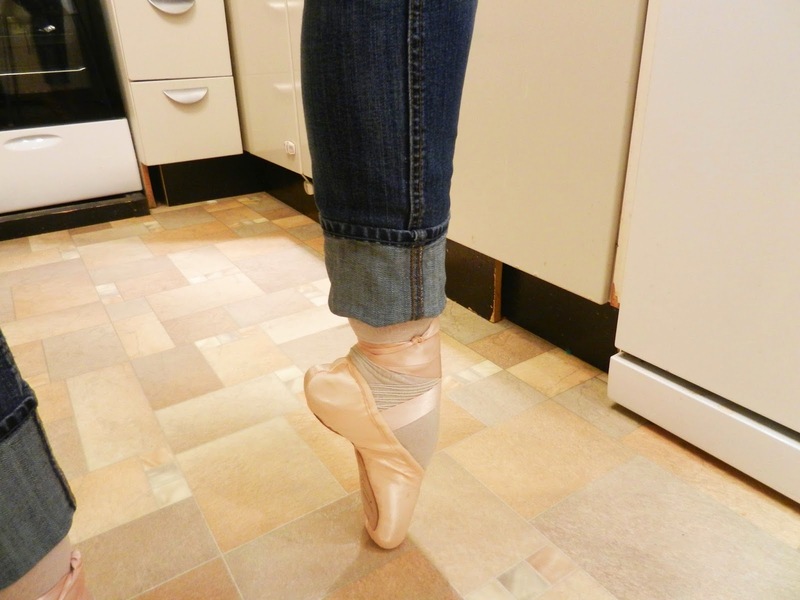 These two joys were far more satisfying than even my beloved ballet, and for many reasons, I decided to quit dancing. I was not sad about it. It didn’t feel like a loss. I was ready to move on. Eleven years later, just this past autumn, after pouring myself out almost exclusively for these two great joys, my family and our life in ministry, I hit a season this where I was really struggling physically, and as a result of the physical struggles, I was exhausted and having a hard time emotionally. For months there were many symptoms that the doctors couldn’t figure out. I went from diagnosis to diagnosis with no successful treatment. I finally got a big part of the puzzle figured out when I discovered that weakness in my back was the cause of a lot of nerve pain. The doctor’s prescription was for me to find a way to exercise in order to regain strength and to correct my posture. Thinking this over, it didn’t take long for me to realize that ballet would greatly help with both. I started taking ballet again about a month ago, after an 11 year break. That first class back was so physically hard, but so exhilarating at the same! I had totally forgotten how much I love ballet. I immediately began feeling better physically as my strength improved, and much to my surprise, doing ballet again has brought a joy to my life that I had completely forgotten existed. There is such great joy and fulfillment in doing things that are deeply meaningful in and eternal sense, but I believe that the Lord also designed us to take joy in other things simply because they are pleasurable. He loves us with a fatherly love that desires to give us all types of joy. Through this little ballet revival of mine, the Lord has reminded me that He not only values me delighting in the deeply meaningful kingdom work that He has called me to, but as a loving Father He also desires to bless me by allowing me to truly enjoy the beauty in this world that He has created. For me, that happens through the motions of dance and the beauty of classical music. For others it will be something totally different. 11 year's later, I got a new pair of "boots!" I’ve also seen how my emotional and physical reserves have greatly increased as I’ve made room for this hobby. I thought I’d be squeezing our schedule and decreasing my capacity to make room for ballet, but I’ve actually found that the opposite has happened because I am so much more energized than I have been in years. Moms, it is so hard to find the time for seemingly frivolous things like hobbies, but wow, had I truly believed the commonly shared wisdom of maintaining a good outlet for personal enjoyment, I would never have let this part of my life slip for so many years. I feel like I am delighting in the Lord in new ways and more able to delight in my callings as a mother and missionary as a result of making this space to care for myself. I know we've all heard such things a million times, but really, it is actually true! For some reason I thought that the years with little ones in particular were a time where such things would need to be set aside (my kids are 9, 7, 4, and almost 2), but I’ve realized that this is perhaps a time where I need this outlet more than ever! Friends, do you have a hobby that you do simply for your own enjoyment? Perhaps a form of exercise or art? Maybe a craft or talent? Is there anything that you do now that makes you experience the Lord's love and care for you simply because you enjoy it so much? If not, what is a hobby or talent that you’ve loved in the past that you have let go? If you’re in the camp that I was in only a month ago of having little to no personal outlet, I would greatly encourage you to try to creatively make space in your schedule to care for yourself in this way! Oh, how I wish I had done this sooner! I love this, Ashley! How wonderful that you've been able to get back into ballet! I have felt the same way for a number of years - I loved playing the piano growing up, but for the past 17 years - after getting married, babies, and moving a million times - I have only played very sporadically. I do now own a keyboard and just need the discipline to get back into it. Even if I never play in church again, for me, playing piano is a sweet form of private worship. You've inspired me to do just that - I will start today! Oh, how wonderful that you're going to start playing piano again, Jen!! I hope and pray that it brings a wonderful and fresh joy into your relationship with the Lord like ballet has for me! Praise God for rediscovered passions! Thanks for sharing this with us, Ashley. This post really resonates with me. For my first 5 years of motherhood (which were also our first 5 years of living here), I really did nothing that was a hobby or something just for my own personal enjoyment. I think that I felt like to be a good mom and missionary, I would just need to give all of that up. But, in the past year, I've started exercising regularly again, and have found that, while it does take a time commitment that takes away some time spent on other things, the time I do invest in exercising energizes me, allowing me to be more effective with the rest of my time! I actually feel less overwhelmed by all that there is to do than I did before! Like Jen, I've been considering taking up piano again. It is something I've always loved and that is peace-giving and restful for me, so I know playing regularly again would be life-giving to me. I also have really missed teaching ESL (I was a community college professor before moving here). I LOVED teaching, and lately I have been dreaming up ways that I could teach language classes again. I'm excited to see what God does with all of this! Our youngest daughter, who just turned 5, recently discovered ballet with a passion. We're hoping to let her take a few lessons to see if its a good fit for her and our family. My personal outlet is running. Its ridiculous (to me, anyway) how long it takes to get my body to where it can handle a mile at a time, let alone an entire 5K. I've noticed parallels between my progress and progress in other areas, like my relationship with the Lord and my son's heart that is healing from years of abuse before he came here. The progression seems to take forever and you cannot really see mile-markers on this course (treadmill...err...dreadmill) but progress is happening all the same. Loved reading this! My hobby/exercise is karate. I found that the regular exercise, and kicking things helps to relieve stress and cope with the frustrations that can really start to get to me. Having a goal to work toward (the next belt) has helped me committed to staying healthy and in shape!